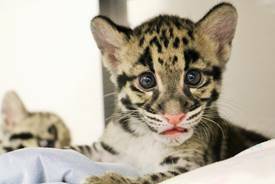 TORONTO, ON, Friday, July 21, 2017 - The Toronto Zoo’s clouded leopard cubs are growing! These two-month old cubs, born on Saturday, May 13, 2017 to mom “Pavarti” and dad “Mingma” continue to progress and grow as healthy cubs. The cubs are very close in size and currently weigh 1.78 kgs and 1.81 kgs respectively. Both cubs are fed a diet that includes formula, consisting of Esbilac and chicken baby food, and feline meat offered to them separately. As they continue to grow in size, they are beginning to transition from being fed from a bottle to eating out of a dish. Right now the cubs are fed four times a day by Wildlife Health and Wildlife Care staff and have been living in the new Wildlife Health Centre’s Intensive Care Unit (ICU). This is an exciting time for Wildlife Health Care staff and Wildlife Care staff as they begin to see the clouded leopard cubs different personalities! One cub is slightly darker in colour, and is more energetic and ‘sassy’, always taking the bottle very quickly when offered. The second cub is slightly lighter in colour, and although also energetic, is not as bold as its sibling. Both cubs vocalize in a bird-like ‘chirping’ sound and love to leap, run, explore and climb anything and everything they can find. Wrestling with each other is another favourite thing for these siblings to do. 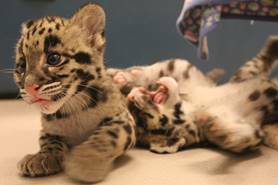 Both clouded leopard cubs have very long tails and their teeth are getting to be quite big in size, which is bringing out their teething behaviors. The Toronto Zoo is participating in a clouded leopard conservation breeding program through the Species Survival Plan (SSP) program. The clouded leopard has been listed since 2008 as Vulnerable on the International Union for Conservation of Nature’s (IUCN) Red List. Please note, the clouded leopard cubs are not visible to the public at this time.